Web Wednesday hits 50 this month! So we're going to celebrate in style...with a special show at Bisous, our sparkling new venue at 9/F, LKF Tower, 33 Wyndham Street, Lan Kwai Fong, Hong Kong (call: +852 8127 7521 or visit www.bisous.com.hk). Join their Facebook Group and follow them on Twitter (@BisousHK). [Easiest way to get there is via the lifts next to the Hard Rock Cafe at the top of Lan Kwai Fong]. 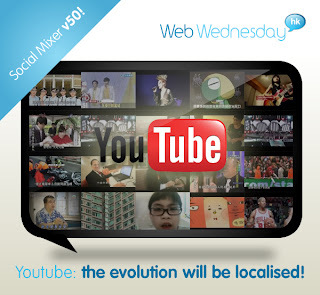 Our guest speaker will be Anthony Zameczkowski, the new Head of YouTube Partnerships for Asia. We'll be talking about YouTube's migration from UGC to professional content and the value of localisation. Sign up on Facebook or via this blog. As per usual, there's a HK$100 entrance fee, including one complimentary drink and the chance to win lucky draw prizes. Our lovely assistant, Vivian, will issue receipts if you need one. (For students, you can get in for HK$50 without free booze). Thereafter, all standard drinks will be charged at special happy hour prices. More details to come... but do spread the word and bring your fellow digerati for a fun night of high-quality networking, insights into the world of online video and a burlesque show with a digital twist!